SPEEDbit Video Accelerator Ends Buffering Problems. SPEEDbit (http://www.speedbit.com/), a world leader in acceleration and optimization technology, announced today SPEEDbit Video Accelerator 3, the latest release of the ground-breaking application that provides for smooth streaming of web videos and HD content. Video streaming on the web today works generally at 50% efficiency, SPEEDbit has found. SPEEDbit Video Accelerator on average doubles and in some cases quadruples the streaming speed and throughput from sites such as YouTube, resulting in a smooth viewing experience with no picture freezes. What this means for SPEEDbit customers seeking a smooth web video experience is that they can turn to Video Accelerator 3 rather than pay for a faster Internet connection with the same level of inefficiency. Viewing streaming video online is already one of the most popular uses of the Internet, and watching HD video is rapidly becoming the next major development in the delivery of rich media on the net. In a recent report sponsored by Internet hosting firm Akamai, revenues from online HD video in the US were predicted to reach $2.2 billion annually by 2012. 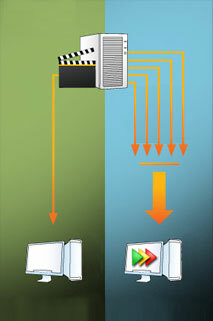 This is reflected in the recent trend of leading video sites looking to HD content to attract new users. However, the experience for the user has until now been sluggish and cumbersome due to, among many reasons, the Internet protocol inefficiency as a means for delivering rich media. Videos delivered in HD hold considerably greater amounts of data than normal resolution videos. For example, a normal YouTube video will average approximately 3 MB of data per minute of video, whereas an HD video will average more than 12 MB. These large data requirements often clog Internet connections, even for users with ultra-high speed connections. In a recent survey SPEEDbit has conducted, more than 50% of users reported suffering from video freezing when watching YouTube in the US. This was true even for users who reported having an ultra-high speed Internet connection in excess of 10 mbps. "When we looked at ways to bring the true HD experience to the average user, we realized that we needed to rethink the problem," said Idan Feigenbaum, SPEEDbit's Founder and CTO. "Most attempts have focused on faster delivery of content from the server. We have taken the opposite approach and our patented solution takes the user's available bandwidth and utilizes it in such a way that videos and HD content are loaded onto their machine significantly faster. In effect, rather than pushing the content like others do, we are pulling with much greater force the content onto the user's machine at a faster rate." "SPEEDbit Video Accelerator 3 is another important milestone in our relentless effort to bring the smooth video experience to our users regardless of where they are located around the world. It is the solution for all, even for ultra-high speed Internet users who, despite their fast connection, still experience picture freezes when watching HD streaming videos" said Ariel Yarnitsky, SPEEDbit's CEO. "We are in the middle of a paradigm shift in the way people around the world consume rich media. It's the "Now Media" era and we are proud to enable it for millions of users around the world". SPEEDbit is a leader in the field of download acceleration with over 187 million installed applications. SPEEDbit was recognized for its work in video acceleration by the World Economic Forum, which named SPEEDbit a 2008 Technology Pioneer. Additionally, SPEEDbit's flagship application, Download Accelerator Plus (DAP), is the world's most popular download manager and accelerator.